So I get hooked on Kayaking. What next? Figure out how not to die - probably a good plan. I was really wanting to go on the Ocean, but given my last few follies on the sea, I think I needed a bit of direction on strokes and rescues. So I plonked down some cash for lessons with Ocean River here in Victoria. 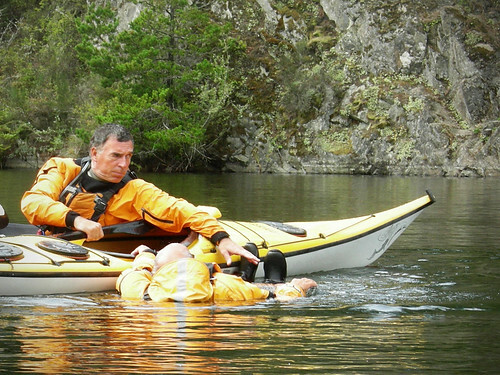 It was a 2 day course offering introductions to rescues and strokes starting in thetis lake and moving to Cadboro bay the next day. 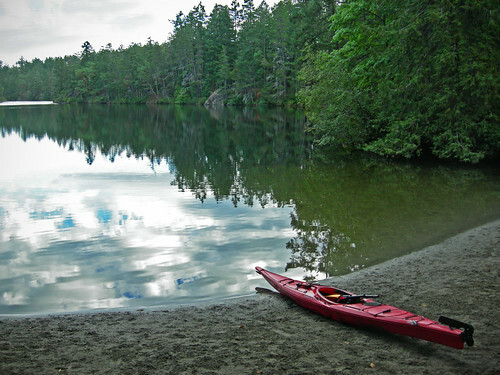 I arrived at thetis lake to dead calm water and a bunch of excited people. I was introduced to Ian Ross and Gary Allen, our instructors for the course, and we proceeded to gear up and get ready for a beating. 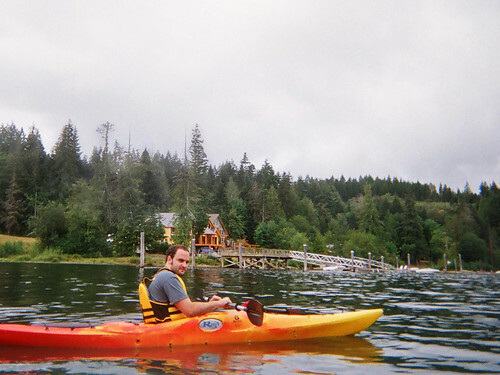 I was paddling in a rotomolded Wilderness Systems Tsunami 145 - nearly everyone else had current designs boats, but I'm just too big for the common CD models. 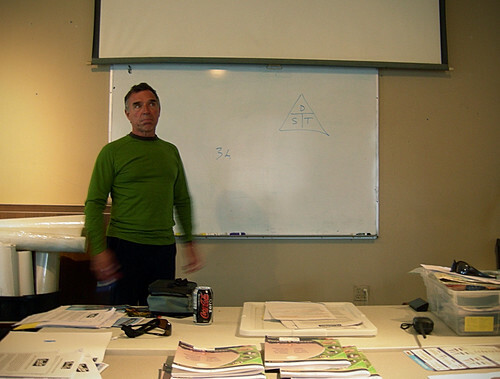 The morning part of the course focused on mostly basic rescue techinques and how to execute a wet exit the right way. Needless to say it was fascinating to just pick up so much information so quickly. The basic two person rescues were much less daunting on nice flat water and it seemed all was going well until I found a fatal flaw (or 2) in my boat design. This is the best story I have so far. 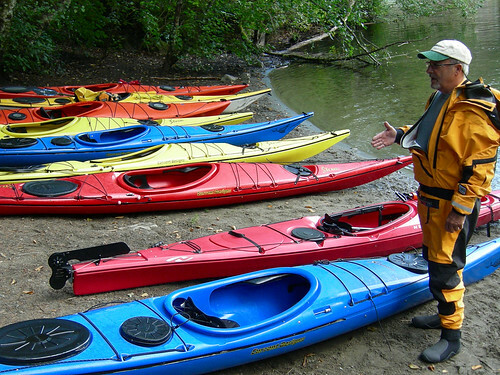 :) It came time to do solo rescues, I put the paddle float on the paddle and put the paddle under the deck lines. I went to hop up on the boat and it summarily tossed me off, and I noticed it had absorbed a whole lot of water from earlier rescues. I laughed a bit and jumped right back up and my hand went right through the rear hatch cover. The kayak was sitting very low to the water already due to a leaky cover and a whole lot of rolling over for wet exits. Before I could get off the deck, the boat was swamped - the much maligned cleopatra's needle. We spent nearly 15 minutes getting the boat to float enough to get back closer to shore using pumps to get rid of the water and paddle floats to add buoyancy. Once we were closer to shore, it just took a couple attempts to get back in because my pfd kept catching on the stupid seat back. All in all that boat got crossed off my list. It doesn't matter how comfortable a kayak is, if it's going to swamp because of poor hatch cover design, that's a massive liability. I guess I got more lessons for my money (and a good story). The latter half of the day was spent in the classroom chatting about weather, currents and safety. We planned out the conditions for the next day's paddle in the ocean. 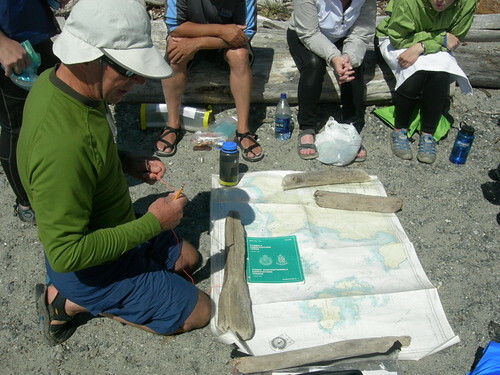 The next morning we met back in the classroom to give one last check over our calculations and decided to paddle Cadboro Bay. The wind had been picking up that morning and when we got to the beach, the winds were blowing about 15kts. Luckily the bay is so protected there's almost no fetch. We just had a bit of a headwind here and there, but as the day progressed the winds died down. After doing some basic maneuvering strokes, we altered course and had lunch on the beach we launched from. Just outside of the bay, you could see whitecaps, and the instructors decided not to take us out and around the point. Back on the beach, we ate lunch and talked about navigation. We sighted a few of the islands just offshore and triangulated our position on shore and learned how to mark a chart properly. Once they finished the map conversation, we went to learn more paddle strokes in a more protected area. We learned a few basic draw strokes and a basic low brace to help get out of trouble. 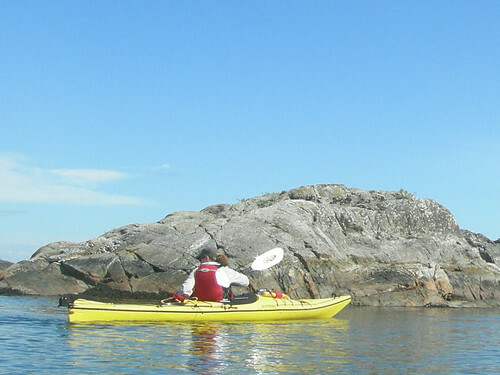 Once the lesson on strokes concluded, we went for a bit of a free paddle out and around the rocks just before the mouth of Cadboro bay. After exploring the area a little and trying our luck in a few of the rock gardens, we headed back in before the next weather system (lots of rain) got to us. Back on shore, we peeled off the wetsuits and racked the boats and we were handed out little certificates for the course. It was a great time on the water and I felt a lot more confident after doing the training. I'd reccomend it to anyone. 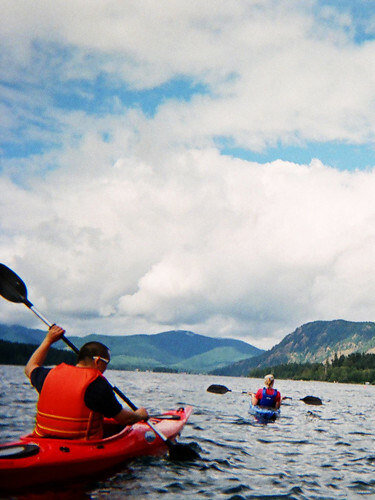 After a couple tries on salt water in rather terrible kayaks and gear, I went up to Cowichan Lake with a few of my friends and had a great time on the water in some big ol' rec boats. 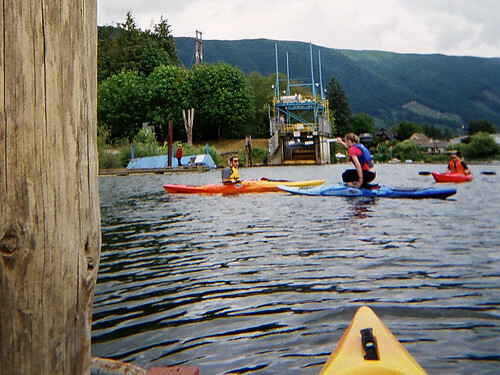 We departed from a little kayak shop called Aquatica of the worlds nuttiest dock. The dock floated at about a 20 degree angle and moved freely in the water - it's no wonder it was still attached to shore. Getting in the boats was still quite a learning experience, but we managed to get in and settled. 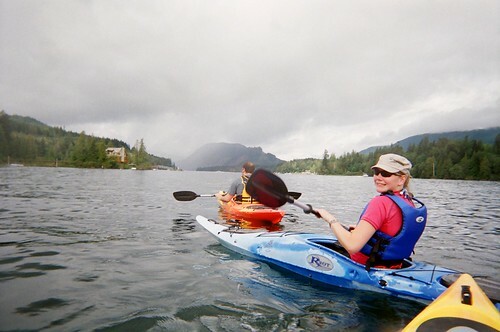 Heading up the river to Cowichan Lake was a light paddle into a bit of current and some surprisingly shallow water. Eventually we ended up at the weir - a dam that controls the flow down the river during the summer. None of us had any clue how to deal with the boat lock off to the side, so we paddled around a bit in front of the dam going "is this it? it's this as far as we can go?" Luckily we had some help from some canoeists unpacking their gear on the shore. "Go pull the string!" Sure enough right in front of the big iron lock door, there was a string hanging down. We maneuvered under the string and pulled. We could hear a distant bell ring. The door wasn't opening. Then we read a sign above the door telling us to stay back a ways. as soon as we moved back, the giant door opened allowing a rush of water out underneath us. Can you believe they want to automate this?! I was feeling pretty glad it wasn't automated at that point or we would have probably gotten a bit wet. 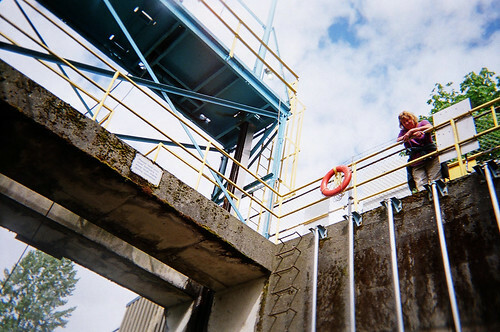 We had a helpful voice up above help us navigate into the boat lock and talk to us about cowichan lake. She let us know about the weir and what it controls. 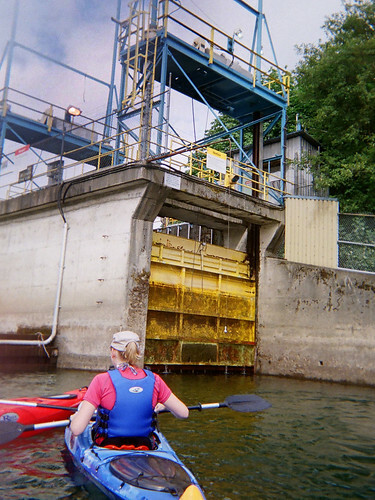 She told us where to paddle to and then slowly operated the lift so we wouldn't get turned around with inrushes of current from the doors opening and closing. When the door opened to the other side it was clear that this was a huge lake. We paddled quickly to the main marina and stuck to the shore. The weather wasn't really clearing, it was in a holding pattern of fog and tiny patches of blue sky. We got to the marina and asked for directions noting all the speed boats whizzing by and kicking up wake. The people on the dock chuckled together and said, "with these idiots?" visibly upset by the other boaters flying by, "I'd stay to the side and make sure they can see you. good luck." So we paddled down the lake and noticed the afternoon breeze picking up. We decided we had paddled far enough into the wind and decided to cross the lake hoping to get in the lee. The crossing was done properly, we all went at the same time and stayed together. A boat in the distance saw us crossing and gave us plenty of berth. We got to the other side, and the wind was a bit lighter in the protection of the hill. We paddled a bit further down to see what we could. Eventually we started running out of time on our rentals, so we headed back in along the shore.